It’s Invasive Species Week 2018 (February 26 – March 2), which is a great opportunity to learn more about plants by looking at vegetative villains. Last year we covered what an invasive species is and why they’re so good at being everywhere (there are levels of invasive-ness and invasive species have plant superpowers). This year we’ll look at one superpower in particular: pokiness. Several years ago I was on a field crew tasked with surveying a random selection of wetlands across the entire state of Utah and somehow ended up visiting the same pokey wetland on the Little Bear River twice. Measuring that wetland was like getting a piggyback ride from a porcupine: we were poked by mosquitoes, stabbed by barbed wire and thorny trees, and carried out a lot of burdock (twice!). Invasive species were invading my personal space and making me bleed. That was just one unpleasant day, but it got me wondering, why are so many soggy, neglected places like disturbed wetlands and roadside ditches full of stabbing weeds? I don’t have time to conduct my own scientific study on the prevalence of pokey plants in disturbed wetlands, but I can review other scientist’s research for answers to my question. It’ll be a blogging and learning adventure. Research Question: Why are disturbed wetlands full of invasive and pokey plants? I’ve got some ideas about what might be happening, because I know stuff about plants, so we can formulate a couple hypotheses to test. 1. Disturbance Hypothesis: disturbances that leave bare ground (e.g. flooding, road building) make great opportunities for pokey plants to invade. 2. Pokey Hypothesis: once established on bare ground, pokey plants grow big and dense (pokier) because they aren’t eaten by animals. 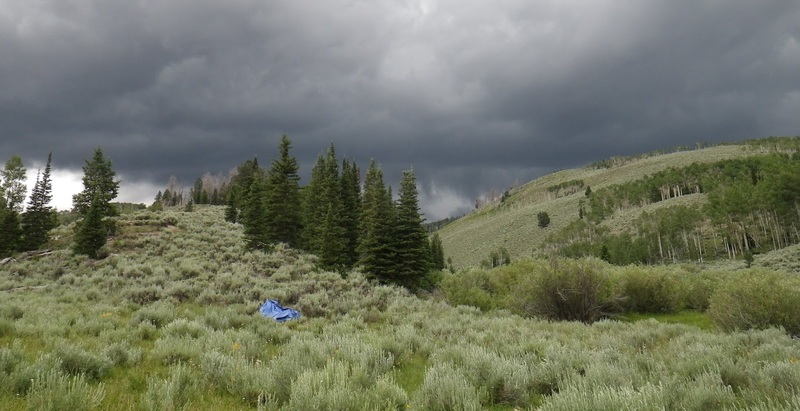 Methods: Looking at the research others have completed on common northern Utah wetland invaders that are also pokey species to see if they support our hypotheses or not. 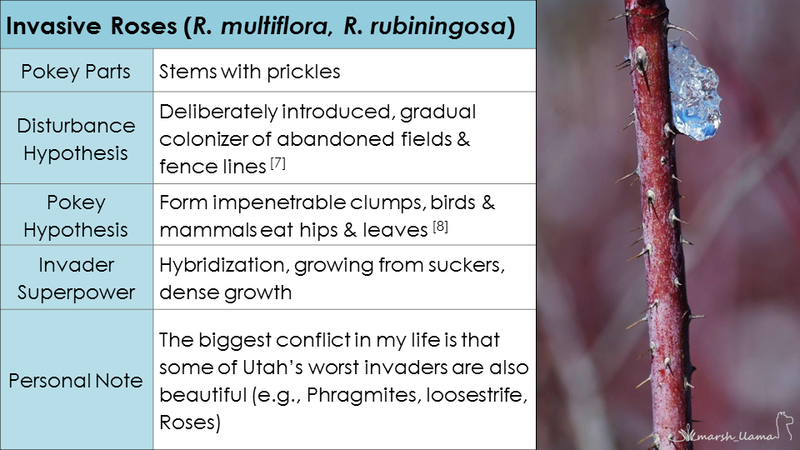 Our invaders of interest in order of pokey length: Russian olive (thorns), Bull thistle (spines), Common burdock (hooks), Roses (prickles), and Stinging nettle (hairs). Before we gently step into the world of pokey plants I should explain what we’re talking about. My trusty plant dictionary  doesn’t define ‘pokey,’ it skips from ‘podogyne’ (a structure that supports an ovary) to ‘pollen’ (male gametophytes). However, it does define spines, thorns, horns, hooked, prickle, process, and many types of hairs (short, long, stiff, soft, straight, or branching). Prickles are small and sharp growths of the epidermis or bark. Sharp parts that come from below the epidermis are spines and small spines are called spinules. 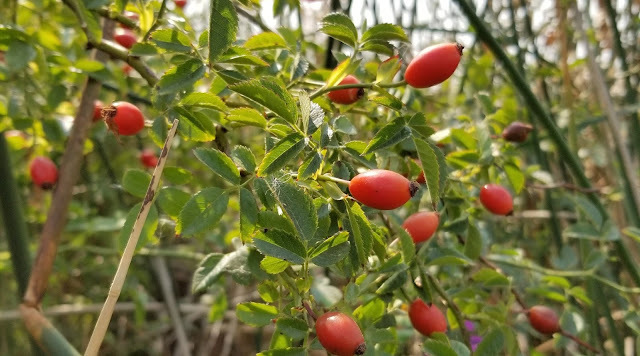 Thorns are woody, sharply pointed modified stems. Short, hair-like poking things are called bristles. Not all pokey parts are straight: barbed plants have fish hook-like rigid barbs, which shouldn’t be confused with hooked plants, whose pokey parts are bent like hooks, but not as stiff as barbs. 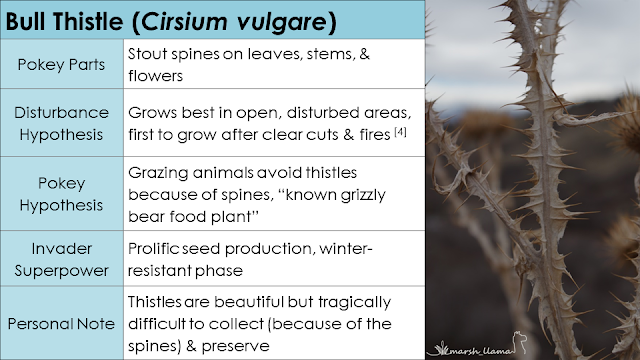 All of this is separate from plant surfaces that aren’t pokey but aren’t smooth, they can be scabrous, siliceous, ribbed, hirsute, or exasperate. In plant terminology spikes are a shape flowers grow in, not at all involved in the world of pokeys. Pokey is my term for plant parts like bristles, prickles, spines, thorns, or hooks. Pokey plans are armed plants and the pokeys are their armature. Well, Russian olive info supports our second hypothesis that being thorny prevents animals from eating you, but fails to support our first hypothesis about disturbance. 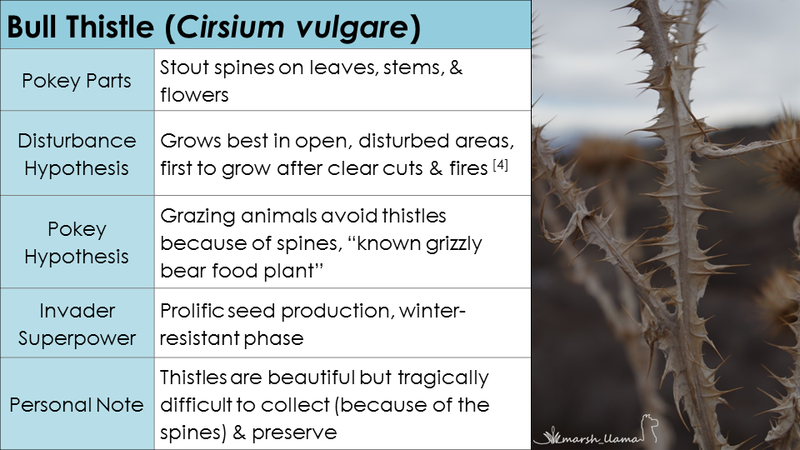 Promising results: Bull thistle is a disturbance-friendly plant that isn't grazed. Both hypotheses supported. Except for bears. Hmmm. 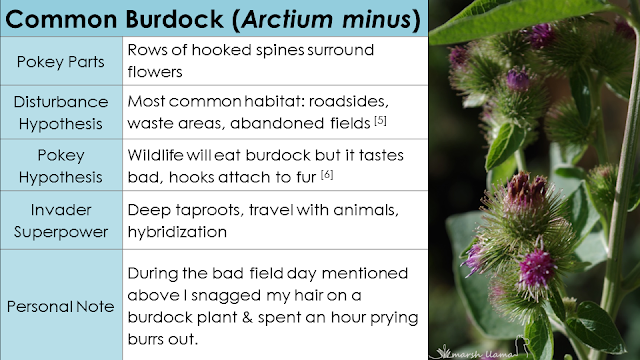 Burdock grows well in disturbed places, but also gets chewed on. Only the first hypothesis on disturbance is supported. Shoot. Roses don't support either hypothesis, they don't need disturbance and they're plenty tasty to animals. 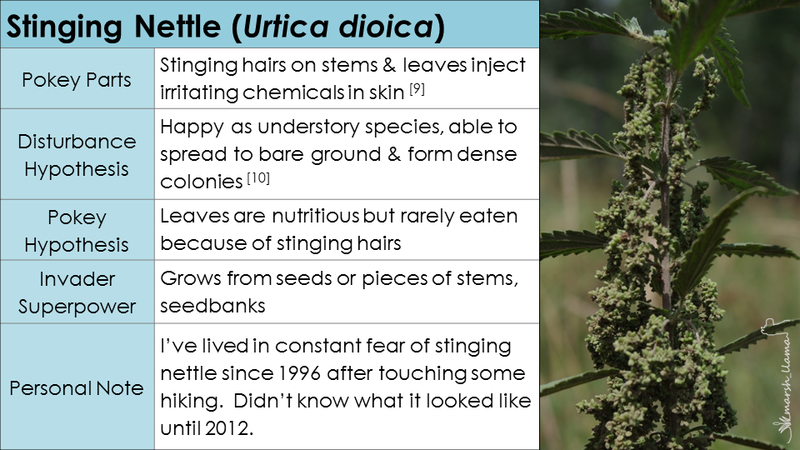 Similar to Russian olives, Stinging nettles aren't often chewed on because of their pokeys, but they don't sprout on disturbed ground. Turns out, invasive species are complicated. 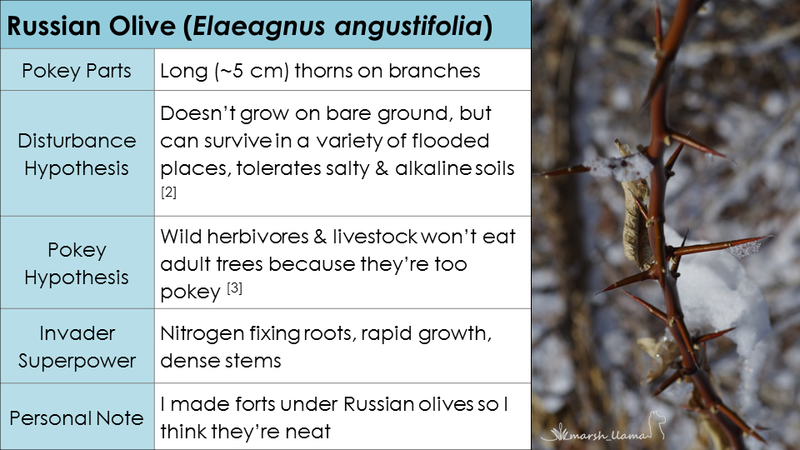 While we found some support for both hypotheses, only Bull thistle supported both because it establishes quickly on disturbed soil and then grows densely because animals will not graze it. Burdock will grow well on bare ground, supporting the first hypothesis, but grazing mammals are willing to chew it and help disperse seeds. 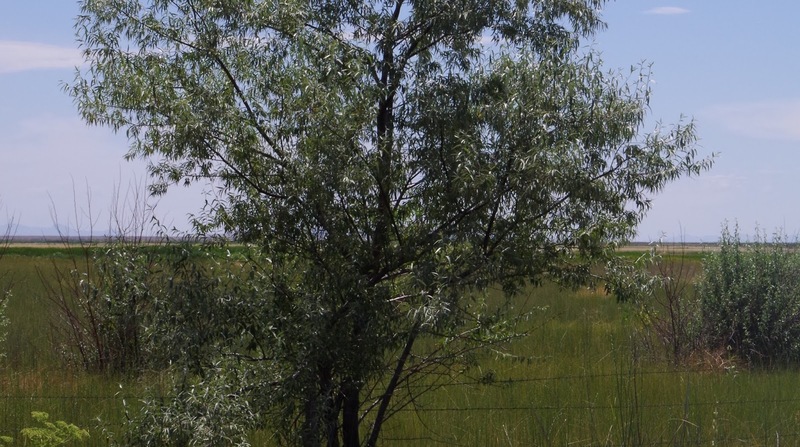 Wild and livestock animals won’t graze Russian olive or Stinging nettle, allowing them to grow tall and dense, but neither establishes on bare ground. Invasive roses supported neither of my hypotheses: they are deliberately introduced and are eaten by many animal groups. In conclusion, pokey plant parts are just of the many features of invasive species that allow them to grow in places they don’t belong. 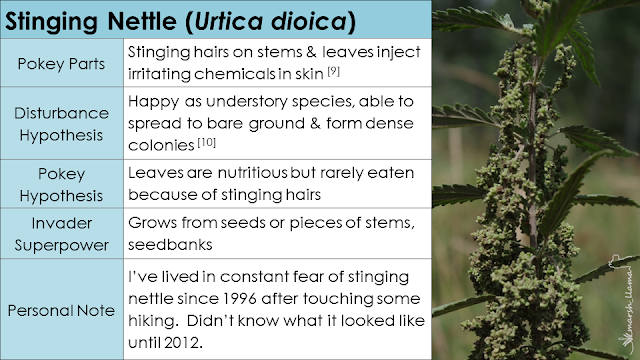 But now we know some fun facts about invasive species that aren’t Phragmites. Harris, J. G., & Woolf Harris, M. (2009). Plant Identification Terminology: An Illustrated Glossary. Spring Lake Publishing, Spring Lake, Utah. Zouhar, Kris. 2005. Elaeagnus angustifolia. In: Fire Effects Information System, [Online]. U.S. Department of Agriculture, Forest Service, Rocky Mountain Research Station, Fire Sciences Laboratory (Producer). Available: https://www.fs.fed.us/database/feis/plants/tree/elaang/all.html . Zouhar, Kris. 2002. Cirsium vulgare. In: Fire Effects Information System, [Online]. U.S. Department of Agriculture, Forest Service, Rocky Mountain Research Station, Fire Sciences Laboratory (Producer). Available: http://www.fs.fed.us/database/feis/plants/forb/cirvul/all.html [2018, February 26]. Munger, Gregory T. 2002. Rosa multiflora. In: Fire Effects Information System, [Online]. U.S. Department of Agriculture, Forest Service, Rocky Mountain Research Station, Fire Sciences Laboratory (Producer). Available: https://www.fs.fed.us/database/feis/plants/shrub/rosmul/all.html [2018, February 27].